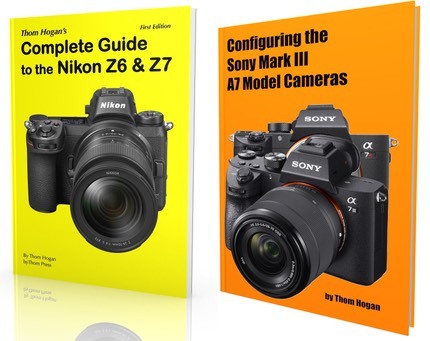 « How Much of a D850 is the Z7? I’ve reached a tentative hypothesis about continuous autofocus with the Z7 after shooting over thousands of images of fast moving subjects (animals) for over a week. Getting the focus cursor/box/indicator where you want it fast enough. The focus sensors all are line sensors and oriented in one direction. If there’s good news, it’s that I didn’t mention “speed” of autofocus as an issue. I’m still a bit on the fence about that one, but I see enough indicators so that I’m leaning more and more towards actual focus speed not being a real issue. I’m still evaluating subject tracking speeds, but that gets us back to the first problem I mention above. With the D5 Nikon took two steps forward and one step backwards. Unfortunately, with the Z7 they’ve taken another step backwards. Well, the D5 was the first camera with a thumbstick where you could program the press of the thumbstick to be AF-ON while still moving the focus position. Prior to this, all of us back-button focus folk had to keep moving our thumb from AF-ON to the Direction pad (and then the thumbstick starting with the D4) and back. Unfortunately, a firmware update took away the simultaneous press+move capability from the D5 thumbstick. You can press, but now you can only move when you’re not pressing. (I’m pretty sure Nikon was responding to some big name sports photographer constantly mashing the thumbstick uncontrollably and complaining that they kept losing their focus point; whoever that was should probably work on developing some finesse rather than complaining). So now the best case we have on the D5 generation DSLRs is that we can keep our thumb on the same control and—with finesse, thus my comment above—use that control to both position the focus sensors and start/stop focus, but not both simultaneously. Now add in another thing: on the D5 generation cameras Nikon allowed multiple buttons to be changed into AF-ON buttons that also switch to a different AF Area Mode when pressed. Thus, I could use the thumbstick as my main AF-ON when I need to move the focus point a lot, but have my regular AF-ON button programmed to a mode where I don’t move the focus position a lot (too bad we can’t set 3D Tracking on the DSLRs that way, but that’s another Nikon taketh away story for another day; really, does Nikon actually talk to sophisticated and thoughtful photographers about what might actually make their systems shine well beyond the competitors instead of just rising a bit above them?). The Z7 can’t do what I just wrote. Any of it. You can assign AF-ON to buttons like the thumbstick press, but you can’t also make the camera switch AF Area Focus Mode when doing so. We’re getting to the punch line: the good news is that the AF-ON button and thumbstick control are close together and I don’t have to change hand position when I move back and forth. The bad news is that the movements of the focus sensor triggered by the thumbstick feel slow. (I write "feel slow" because technically I seem to get about the same sensor move speed across the same area as with the D850, but I can move the Z7's focus sensor further, so going from one extreme to another is slower.) In some AF Area Modes where you're trying to position the cursor precisely, it can be painfully slow for a big move. Indeed, I kind of want my thumbstick press on the Z7 to be Select Center Focus Point, as that can move the focus cursor halfway across the frame fast when I start getting out to the edges with the focus cursor and now need to change what I’m doing. What that all tends to mean is I either miss focus or I miss shots when my subject is moving all over the place in the frame. And forget using the Direction pad: it doesn’t move things faster and it’s going to change your hand position and thumb position to reach it. You can use the OK button in the center of the Direction pad to move the focus position snappily back to center, but again, you’re shifting your thumb considerably off where it normally would be and that OK button is actually a bit difficult to find by touch, particularly with light gloves on. The temptation is to give up back button focus entirely. But even that doesn’t help all that much with the current implementation. I could imagine using shutter release focus with my thumb dragging on the rear LCD to establish focus point solving the move-the-focus-position-quick issue, but we don’t have that option. Which brings us to Tracking autofocus (Auto). OMG. What was Nikon thinking? It’s unusable in most practical situations you’d want to use it for. One person wrote that it worked for them to track the goaltender in a soccer match, and I did some testing to see if I agree. Yes, there are a few situations where the tracking focus works adequately, but is still a big pain when you want to shift to shooting something else. And again, we have the moving-the-focus-cursor-further issue intersecting with trying to use Tracking for changing subjects that are constantly moving. Too many button presses and control moves to get things set, and by the time you complete those, the moment is gone. Hey Nikon: still cameras are about capturing moments. Remember? So here’s my hypothesis: focus speed on the Z7 is perfectly fine. The speed at which you get the focus system set properly to the thing that’s moving is the problem. Nikon, if you’re reading this, this is an issue that makes the Z7 seem worse than an A7Rm3 when it might actually might not be. The AF-C autofocus area mode choices and how they’re controlled feel incomplete and untested in the more extreme shooting situations. All that said, I’ve been shooting fast moving animals and sports for about 45 years, which takes me all the way back to the era where I had to do everything because there was no automation ;~). So yes, I managed to get plenty of keepers in my most recent shoot—particularly as I started to understand what the camera can and can’t do—but it's not the number of keepers I’d have gotten from a D7500, D500, D850, or D5 in the same situation. Note that I wrote hypothesis. That means I’m still testing. When my review eventually appears, it will be because I’ve completed my studies.